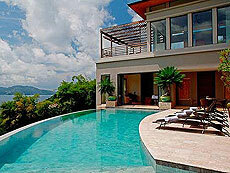 Gorgeous 5 Bedroom rental villa with panoramic view of Andaman Sea and Nakalay Beach. Fah Sai is a private residences in the Samsara Estate located in Kamala. Ever featured in The New York Times, Fah Sai is the elegance and welcoming you with a panoramic view of the Andaman Sea and Patong Bay. The villa also has a games room, fully equipped with an Xbox360, card table and tread mill. Fah Sai villa is totallly give you a satisfaction for spend a special time in Phuket.